The Government has been given an overall C grade. The eleventh Children’s Rights Alliance annual Report Card will be launched today, February 26, 2019, the third under the current Programme for Government. This year the Government is awarded an overall ‘C’ grade for living up to its promises to children, a slight increase on last year’s ‘C-‘ and a significant improvement on the ‘D+’ grade that was awarded in 2017. 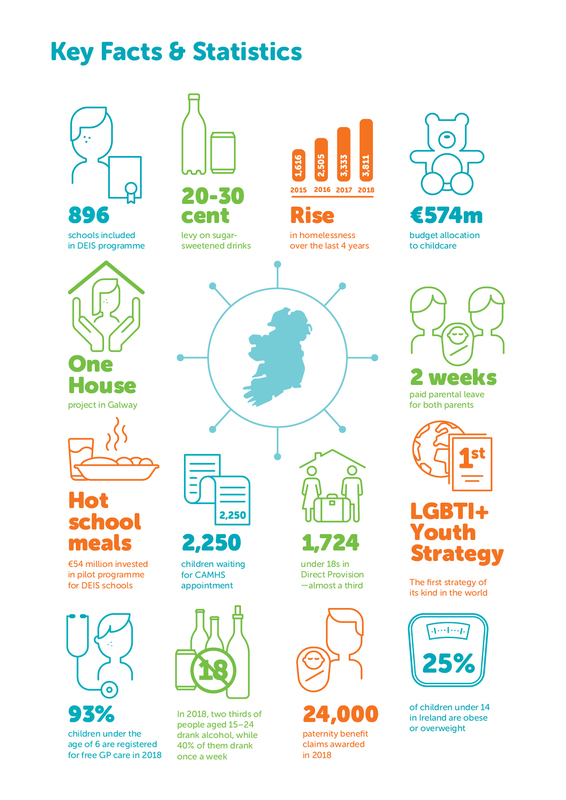 Speaking at the launch of the Report today, Chief Executive of the Children’s Rights Alliance, Tanya Ward said: “The ‘C’ grade is an improvement and acknowledges the Government for their steady progress in a number of areas. There is no doubt that in 2018, important steps were taken to protect and empower children. Chief amongst these, Ireland led the world in introducing the first ever LGBTI+ strategy. This will help to support this group of young people who often face prejudice and discrimination in their everyday lives. For this, the Government receives an A- grade, the highest in Report Card this year. A steadfast ‘B’ grade was awarded for ‘Physical Health’ reflecting the enactment of the Public Health (Alcohol) Act 2018. Alcohol abuse is a public health crisis and this is an important, long-awaited stride forward to protect children from alcohol harm and harmful parental drinking that can have such a detrimental impact on children’s lives. Significant investment by Government in more affordable childcare will undoubtedly help families who are crippled by childcare costs. For example under the new scheme, a two parent family with an annual take home pay of €30,000 and with two children under three will get a weekly subsidy of €220. We also welcome Budget 2019 measures for families with older children with an increase in weekly social welfare payments of €5 for over 12s, recognising the higher costs of raising teenagers. The introduction of two weeks paid parental leave for each parent in 2019 gets an improved ‘B-’ grade for this area, helping move towards a more family-friendly society where both parents can spend more time with their child in their first year of life. On the flipside, the lowest grade in Report Card 2019 is an ‘F’ or a ‘Fail’ for ‘Child and Family Homelessness’, which reflects the record number of children who were homeless in 2018. Government needs to recognise that child homelessness is a national emergency. Family hubs and other interim solutions provide only a sticking plaster to what is a bigger and more complex issue. To truly address this crisis, more public housing must be provided rather than over-relying on the private rented sector. This is the first time under the Programme for Government that the Report Card panel of experts have awarded a score so low. The outlook on Mental Health is not good either, with the Government awarded a ‘D-‘ to reflect 7,206 children on waiting lists for an appointment for community and psychology supports (September 2018). These services focus on prevention, assessment, early detection and intervention for children in difficulty. There are also 2,250 children waiting for specialist mental health treatment through Child and Adolescent Mental Health Services (CAMHS) (October 2018). While there have been improvements in recent years, children continue to be placed in adult inpatient units. Changes to the Direct Provision and international protection system have resulted in a C grade, up from a D+ in 2018. This is the highest grade ever awarded for this section and comes following some significant positive steps by the Government this year. This includes a third increase to the Direct Provision payment for asylum seeking children in as many years, up from €21.60 to €29.80 a week for children living in Direct Provision. The development of national standards for accommodation for people seeking protection is particularly important as they will address institutionalisation and will ensure that families with children will have their own private living space. However, we will know that the Government means business when independent inspections for Direct Provision accommodation are in place.